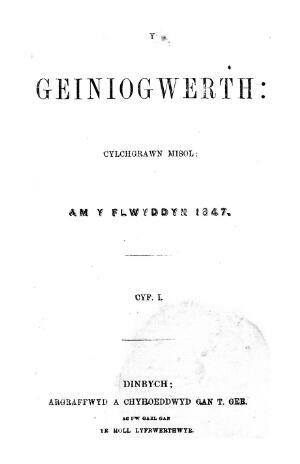 A monthly Welsh language religious and general periodical serving the Calvinist Methodist denomination. The periodical's main contents were religious and temperance articles, poetry and news. The periodical was jointly edited by David Charles (1812-1878) and Lewis Edwards (1809-1887) until November 1847, by David Charles, Lewis Edwards, Lewis Jones (1808-1854) and John Parry (1812-1874) until June 1849, and subsequently by Lewis Edwards, John Parry and Lewis Jones. Associated titles: Y Methodist (1852).